Barceloneta beach has to be one of Barcelona’s most-visited beaches. The 1.1 km long sandy beach begins at the Olympic Port (Port Olimpic) and follows the coast past Barceloneta to the street called Almirall Cervera, where it joins the most southerly beach in Barcelona: Playa de Sant Sebastiàn. 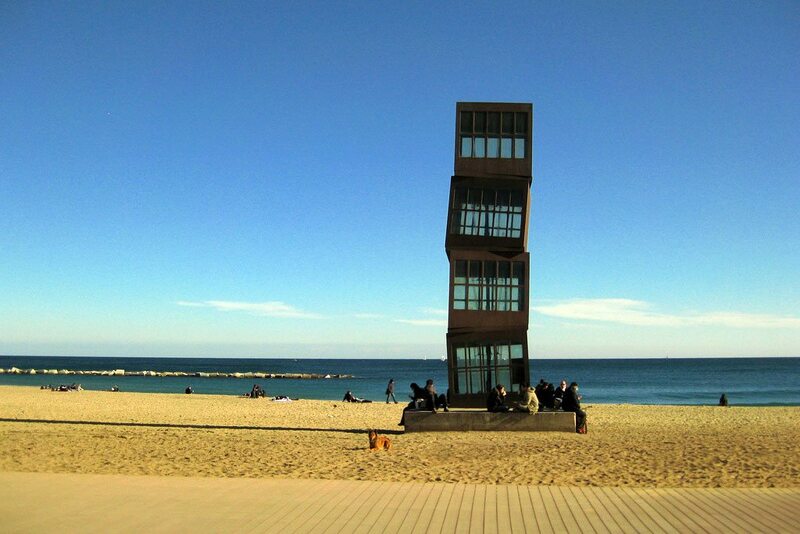 At the start of Barceloneta beach, at the Olympic Port, the famous fish-shaped sculpture rises up above you. In this area you can find numerous shops, cafés, restaurants, a casino and the Arts Hotel, Barcelona’s classiest hotel. Nearby you can also find one of the city’s hospitals with the best sea views: Hospital del Mar in Barceloneta. In the middle of the breakwater there is an open-air gym, which is free to the public. 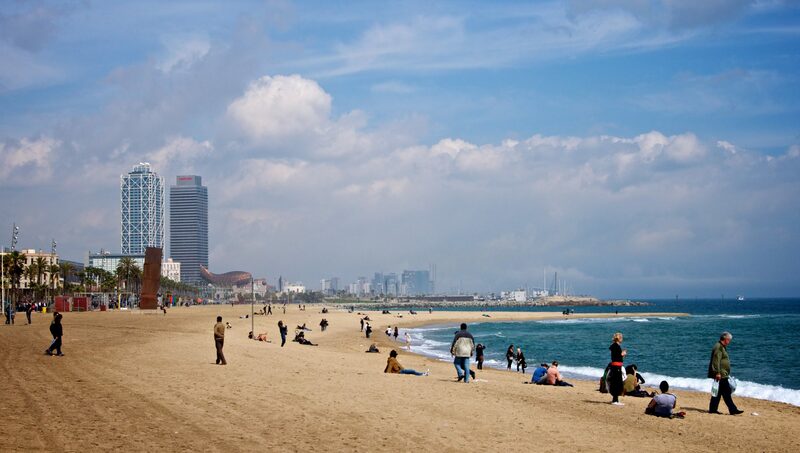 Barceloneta beach has showers, toilets and all of the infrastructures that you could wish for at a city beach. 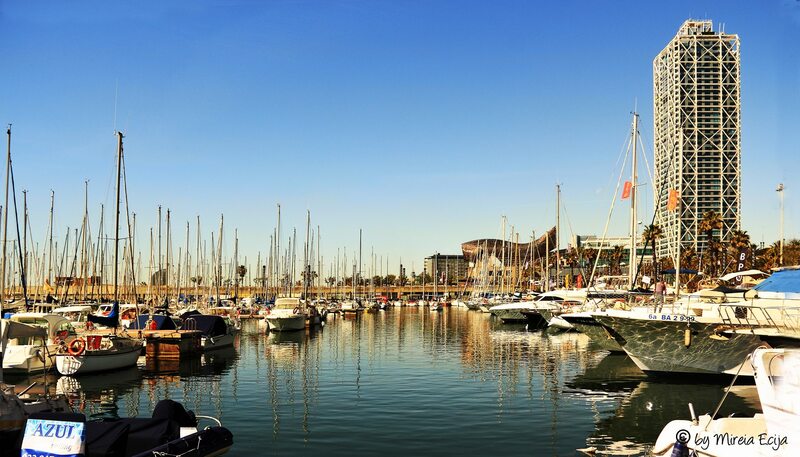 Whilst you relax on the beach, you can watch the yachts coming and going in the Olympic port and then go to one of the many restaurants that can be found on the seafront at Barceloneta beach. Restaurants are lined up along the seafront at Barceloneta and some of them become nightclubs in the evenings (Opium, CDLC, Shoko). See Barceloneta nightlife for more information. From north to south you can find the following restaurants: Bestial, with a set menu for around €25 on the terrace, Pez Playa, Sotavento Beach Club Bcn, Ice Bcn, Shoko, Opium, CDLC, Agua and the small bar belonging to the Catalonian swimming club CNC – Club Natació Catalunya. Further down the beach at Barceloneta are the restaurants Ca la Nuri, Sal Café, Baba Cool, and El Arenal bicycle hire. Finding a parking space near Barceloneta beach can be very difficult. There is a pay car park on the avenue Passeig Joan de Borbó.